Rhodes (Elli) Being one of the most popular Greek beaches among photographers, the beach of Rhodes still retains something of its cosmopolitan aspect from the 70's, and is one of the most visited beaches on the island. The first traces of life on the island of Rhodes are lost in the fog of myth. The first inhabitants are said to have been the aborigines Heliaden, agreements of the protective god Helios and the Telchines, a strange kind of people who supposedly resembled demons. These were, according to tradition, skilled sailors and skilled craftsmen who taught the ancient Rhodians how to forge and process stone. Archaeological excavations revealed that in the 16th century BC the Minoans inhabited the island, followed by the Mycenaeans, who settled here in the 15th century BC. After the 8th century B.C. the first city states lalysos, Lindos and Kamiros were built, which together with Kos and the small Asian cities Knidos and Halikarnasos founded the Doric six city federation "Hexapolis". According to this, it is the first city association of the world known at that time, which had political, economic and cultural dimensions. The prosperity and the development of the island was mainly due to the trade as it was geographically located on the ancient trade artery which connected numerous Greek cities and the way continued to Sicily, back via the Cyclades with main station the island Rhodes and further to Cyprus and Phoenicia. In the time of the Ptolemies, another very important trade route was opened for the Rhodians, which extended from Asia Minor over Rhodes and further to the Nile delta and Kirene. Very early all three city states minted their own coins; a fact that testifies to their economic prosperity. A milestone in the history of the island was the decision of the three cities in 408 B.C. to jointly found a new powerful city at the northern tip which was able to carry the sceptre of power and prosperity for many centuries to come. Like all other Greeks, the Rhodians fought in the war against the Persians and received the Macedonians on the island under the leadership of Alexander the Great. Due to its strategic position, Rhodes was occupied by the Romans in the 2nd century BC. 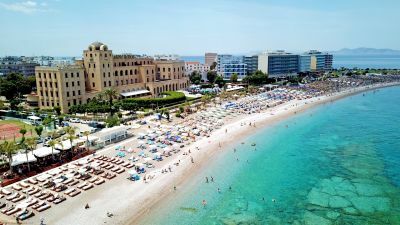 Since that time, however, mainly after the 1st century B.C., Rhodes developed into an important cultural center, while its fame spread over the entire Mediterranean area. In a quiet and shady pine forest on the hilltop of Filerimos, which is located on one of the first ancient towns of the island, Ialysos (Ialyssos), stands the astonishing Byzantine castle. Built during the Byzantine Era, the castle lies within a cluster of buildings of major historic importance, amongst Byzantine, Hellenistic and Medieval structures and monuments, including the Temples of Athena Polias and of Zeus. When you approach the walls of Medieval Old Town of Rhodes you are about to enter the oldest inhabited medieval city in Europe. It's a thrill to behold. Best to know one thing from the start about the Old Town of Rhodes: It's not laid out on a grid - not even close. The building of the Post Office is located on the Liberty Square (Platia Eleftherias) of the modern city of Rhodes. It is an excellent specimen of the Rennaisance Eclecticism and the "Finta Pietra" technology. The Hospice of St. Catherine was built in 1391-92, under grand master Heredia, by the Italian Domenico d'Allemagna, admiral of the Order of the Knights of St. John (Knights Hospitaller). The founder was an important personage, disposing of considerable means. The castle was built in the 12th century, during the Byzantine Era, by the Knights of the Order of St. John, whose main interest as soon as they arrived on the island in 1309, was to construct protective fortresses, preferably overlooking the sea, in order to defend themselves from the enemies. The castle of Kritinia (Kastello, for the locals) ,is a Venetian castle built in the 16th century on a hill about 131 meters above the village of Kritinia. It is fairly considered the germ of the village as it offers a breathtaking view of the Aegean Sea, the island of Chalki and some other deserted islands. Within the walls of the Acropolis of Lindos, lies the Medieval Castle, the Governor's Palace of the Castle of the Knights of St John, consisting of three buildings, with only two remaining today.